Over the course of just one year, it is estimated that one billion plastic water bottles are not recycled in Ontario. This staggering figure raises questions about the irrationality of the continued use of plastic bottles – and for good reason too. Despite the fact that most Canadians have access to alternatives to disposable bottled water, the water-bottle industry in Canada still generates sales of $2.5 billion annually. This overdependence on plastic water bottles seems absurd, considering the abundance of water that is available in Canada. The more worrisome implication of water bottle usage are the risks it poses to the environment and aquatic ecosystems. If plastic water bottles are not recycled properly, they can end up in landfills or large bodies of water instead. In turn, this poses serious concerns for wildlife, especially for aquatic ecosystems. 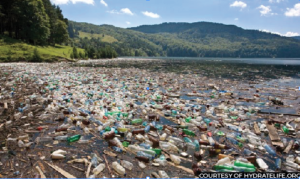 The plastic debris in oceans or lakes breaks down into tiny plastic particles that are then consumed by fish, who are unable to distinguish the debris from food. In fact, roughly one in four fish contain plastic or other man-made material in its guts. This can prove to be disastrous for humans too, as consumption of seafood introduces these tiny pieces of plastic into our body. Additionally, plastic water bottles pose numerous other health concerns for humans. These effects are mainly due to the chemicals found in the plastic bottle that transfer in small amounts to the water itself. Over time, the concentration of these chemicals in the water greatly increases, potentially causing sickness from its consumption. With all of these cons to using bottled water, the question arises: why do so many Canadians continue this irrational and lethal habit? The most obvious answer is for the sake of convenience, as bottled water provides a reliable option for hydration on the go, despite being a problem easily solved by using a reusable bottle. The less apparent rationale lies in the glamour of bottled water. This may sound absurd, but bottled water companies promote their products using images of mountains and snowy landscapes for a reason. Consumers often associate a degree of purity with bottled water, giving the impression that it is cleaner than tap water; however, this is not the case. Bottled water is often just filtered tap water, it is of a similar quality to tap water. Plastics bottles also work out to be significantly more expensive than using a reusable water bottle. When bought in bulk, a typical price for bottled water is $0.16 per litre, whereas tap water only costs tenths of a cent per litre. With all this information in mind, it becomes easier to see that buying bottled water is an unhealthy alternative to using tap water, as the user’s health is put in jeopardy through the plastic bottles. For Canadians across the nation, this realization could help them to stop this dangerous and irrational habit once and for all.